Proactive Advisor Magazine: Vic, please give an overview of your firm’s mission and the services you provide. 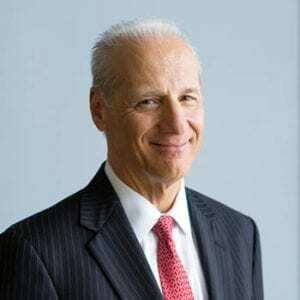 Vic Tedesco: I was one of several founding partners of Strategic Financial Advisors Corporation and Strategic Financial Services Corporation in 1987 and am now the sole remaining founder. My training and experience in the financial-services industry were influenced greatly by the philosophy of “serve clients first,” and that has been our mission since the start. We see our role as “financial architects” for families, small-business owners, professionals, retirees, and other individuals. As financial architects, we believe in developing detailed plans before laying the foundation of an investment or risk-management approach. To this end, our firm strives to meet the specific needs of each client by employing a customized financial-planning process. Generally, we provide services such as income-tax planning, cash-flow budgeting and debt management, investment and retirement planning, estate planning, goal funding, and capital-needs analysis. We look to employ sophisticated risk-management techniques across all of these disciplines. We are proud of the fact our firm and our process have earned the trust of clients with diverse backgrounds and across different industries and professions. Andrew, how does the planning process work from an implementation perspective? Andrew Leithe: First, we meet with clients over approximately six months to analyze critical areas for improvement, create a customized action plan, and assign responsibilities to successfully implement the financial plan. During this phase, we perform rigorous discovery and get to know clients on a personal level. After six months, we provide the client with a financial road map, including our analysis, financial plan, and action steps. This usually covers several of the important areas that Vic described. We then allow time for the client to review the analysis and plan, provide clarification as needed, and potentially make revisions based on feedback. The client may retain our services after this stage, and we will meet with them regularly to update the plan, depending on their preferences and situation. We believe this is important given that goals, life circumstances, and personal finances continuously evolve, and the regulatory, tax, and investment landscapes may change over time. After reviewing and approving the financial plan, most of our clients will engage our services to implement the investment and risk-management elements of the plan. Technically, this is assigned to our affiliated firm, Strategic Financial Services Corporation, but our financial-advising team is deeply involved in both the planning and implementation phases of our engagement with clients. To reinforce what Vic said, this process is built around serving the needs of the clients first. While the process takes time, we believe it is time well spent, as the financial road map should have a beneficial impact on the lives and financial health of our clients. Vic, can you describe your philosophical approach to investment management? Vic: Everything we do on the investment side begins with the financial plan’s identified objectives and how that informs the creation of the investment plan. We are also driven by consideration of risk factors, including overall market risk, analysis of portfolio risk, and an individual’s or family’s specific risk tolerance. We have tools to help us identify risk tolerance in light of a client’s behavioral or personality characteristics, time horizon, and possible reaction to volatility or levels of portfolio drawdowns. We test how they would feel if their portfolio was down 10%, 20%, or 30%. Behavioral finance theory and our experience tells us that people tend to overestimate their capacity to handle risk when markets are performing well, and we need to make sure client portfolios are aligned with what might occur in a bear market. Overall, we want to help clients achieve returns consistent with their plan objectives and their capacity for taking on risk, both psychologically and in terms of protecting assets. From there, we use strategic allocation modeling to develop a personalized investment plan that aims to preserve and grow wealth. We implement this design through a variety of investment strategies consisting of ETFs, third-party money managers, sector- and asset-class-specific strategies, principal-protection strategies, and tax-deferral investments, among others. We have many strategic and tactical alternatives to select from, and we employ those that are consistent with a client’s goals-based objectives. Andrew: One way we describe our asset-allocation model to clients is by asking them to visualize a pyramid. The base of the pyramid is the foundation of their investment plan, and it primarily consists of strategies that are lower in risk. Some of these assets might be in very liquid types of investments that are available as needed to fund income disbursements or emergencies. A portion might be in strategies from third-party managers in the fixed-income area, where tactical management can respond relatively quickly to changes in the market environment. We think competitive returns can be achieved with these types of strategies while managing risk closely. More strategy layers are added as you move up the pyramid. For example, for clients with immediate income needs or who are planning for retirement, we might consider income-producing investments, such as managed strategies that produce dividends without sacrificing principal over the long term. Further up the pyramid we usually have managed equity strategies that can emphasize growth while staying aligned with clients’ risk parameters. Many of these strategies are from third-party managers that have deep experience with their strategic approaches across all kinds of market conditions. As we evaluate both managers and strategies, we look closely to see how they have performed in adverse markets as well as bullish market periods. As that analysis takes shape, we build the strategic allocation model that we think works best for a specific client. We are proud to offer clients sophisticated strategies that can access asset classes from around the world, can blend both active and passive approaches, and have a strong orientation toward diversification and risk management. Vic: Another important part of our approach to investment management is the constant monitoring of each client’s investment plan. As a client progresses through different life stages, it is important to create a cohesive investment strategy that balances risk with return according to their current situation. We review and revise both financial and investment plans for clients throughout their lives, enhancing the probabilities that they will stay on track toward achieving their goals. We also conduct a great deal of due diligence on our money managers, and that is an ongoing process. What is the amount of risk they take in their strategies to achieve the return that they’re getting? What is their investment process? Their fee structure? What type of management style do they have, and does that blend well with our clients’ needs and goals? The answers to these questions facilitate our ability to match the appropriate manager strategies with our clients’ portfolio objectives. What life experiences influenced your passion for the advisory business? Vic: My father passed away when I was very young, and my mother did a terrific job of raising and supporting three children on her own. She lived to be over 90, and I feel blessed with having her in my life so long. She taught our family the values of hard work and helping others. The “serve first” concept I learned early in my career has always resonated strongly with me, and I can think of no better guiding philosophy for our practice as we work with clients to improve their financial lives. Andrew: My parents are both in the medical field, and I admire their ability to affect people’s lives. I have always had a strong interest in helping others and have been involved with many volunteer efforts throughout my life. As I entered the financial industry and gained technical experience, I think it was just natural that I would be drawn to the advisory field. Vic has created an ethic at our firm that is an excellent fit with the way I think clients should be served. A six-month timetable of specific milestones to achieve a final, agreed-upon financial road map covering detailed analysis, goals, and action steps. Regular progress reviews on a schedule that meets client needs, usually every four months. Periodic meetings with clients’ trusted third-party advisors such as insurance specialists, attorneys, and accountants. Weekly internal workflow meetings to prioritize client tasks and proactive communications. 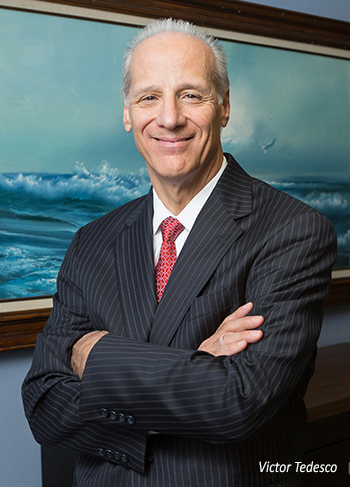 A graduate of Kennedy-Western University with a degree in business administration, Mr. Tedesco also received his master’s in financial services (MSFS) from the Richard D. Irwin Graduate School of The American College. He has earned the Certified Financial Planner (CFP) and Chartered Financial Consultant (ChFC) designations. Mr. Tedesco hosted a financial education radio and television program airing on Philadelphia metro area stations for 14 years. Mr. Tedesco and his wife reside in southern New Jersey and have two daughters and four grandchildren. They are active members of Coastal Christian Ocean City Church. Mr. Tedesco enjoys volunteering, working out, traveling, and spending time with his family. Andrew Leithe is a managing director and investment committee member at Strategic Financial Advisors Corporation. 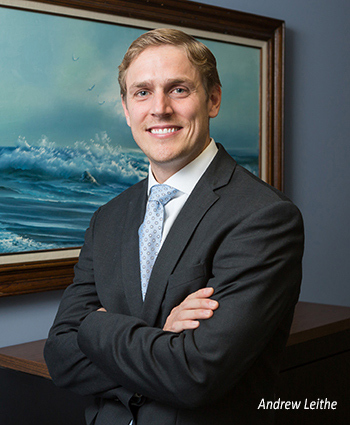 He joined Strategic Financial Advisors in 2015, bringing an extensive analytical, asset-management, and technological background to the firm. Mr. Leithe began his career at FrontPoint Partners, where he covered various long/short equity and credit strategies across multiple sectors and geographies. He has worked for JP Morgan’s Private Equity and Real Estate Services group, Apollo Global Management, and Siguler Guff & Company LLC, and has experience in private equity, real estate, credit asset management, and separate account strategies. 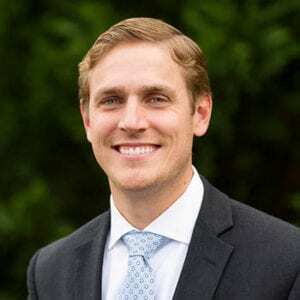 A graduate of Furman University, where he studied business administration, Mr. Leithe has earned the Certified Financial Planner (CFP) designation and is a graduate of the Investment Banking Institute. He is actively involved with the Furman Metropolitan Fellowship, which supports career-building for Furman students and graduates in the New York City area. Disclosure: Securities and investment advisory services are offered through FSC Securities Corporation (“FSC”), member FINRA/SIPC. Additional advisory services are offered through Strategic Financial Advisor Corp. and Strategic Financial Services Corp. FSC is separately owned, and other entities and/or marketing names, products, or services referenced here are independent of FSC.